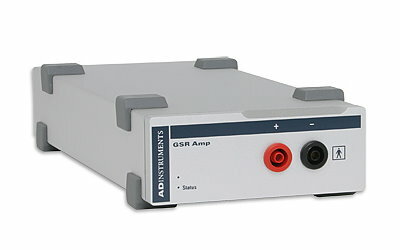 Thank you for your interest in GSR Amp. Please complete and submit the form below and an ADInstruments representative will aim to get in touch within one working day. If you’d like to speak to someone immediately, office contact information is available from the contact page. A fully isolated galvanic skin response (GSR) amplifier with low voltage, 75 Hz AC excitation and automatic zeroing. A fully isolated galvanic skin response (GSR) amplifier with low voltage, 75 Hz AC excitation and automatic zeroing. The GSR equipment is designed to work with a PowerLab data acquisition system to measure human GSR, now known as electrodermal activity (EDA). The low-voltage AC excitation reduces the electrode polarization artifacts found in DC systems. 75 Hz oscillator which supplies a near square wave, low-impedance, low-voltage (22 mVrms) signal to an electrode on one finger of the subject. Galvanic isolation for subject safety and approval to the IEC60601-1 standard for human connection as a body protected (BF rated) instrument. Connection type: 2 × 4 mm (0.16") shrouded banana plugs to custom cable. Two dry, bright-plated, bipolar electrodes with Velcro™ attachment strap suitable for adult fingers. I2C port: Provides control and power. Interface communications rate of ~50 Kbits/s.